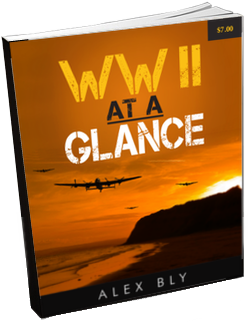 This is how I became interested in World War II – What About YOU? Machine guns have been a big part of war ever since World War 1. By World War 2 and even after their purpose has not changed. The main use of machine guns is to suppress the enemy with a large volume of fire at a very fast rate. They make it difficult and scary for an enemy show their face or shoot back. Shooting accurately and calmly is near impossible with so many bullets coming your direction and often whizzing right by. These weapons are often mounted on a bipod to decreases recoil and better control. 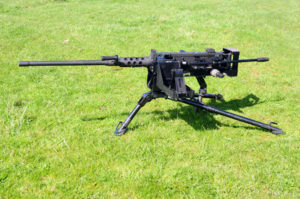 Machine guns have a rifle sized caliber bullet, They were generally operated by a two-man team, one to shoot and the other to load and reload the machine gun. Sometimes it would be a squad with three or four men and the other men would bring more ammunition to the front. In WW2 most rifles were bolt action so the average machine gun could shoot many more bullets than ten men with a bolt-action rifle. For example a German soldier with a Kar98k could shoot 15 rounds per minute at most while a soldier with an mg34 machine gun could shoot at least 800 rounds per minute with the slowest MG 34 model. That means it would take 53 men with a bolt-action rifle to match one MG 34 crew of 2-4 men but most often it would just be two men. Some of the main machine guns of World War 2 were the American M1919 browning, British Bren, Soviet DP-28, German MG 34 and Japanese type 99. 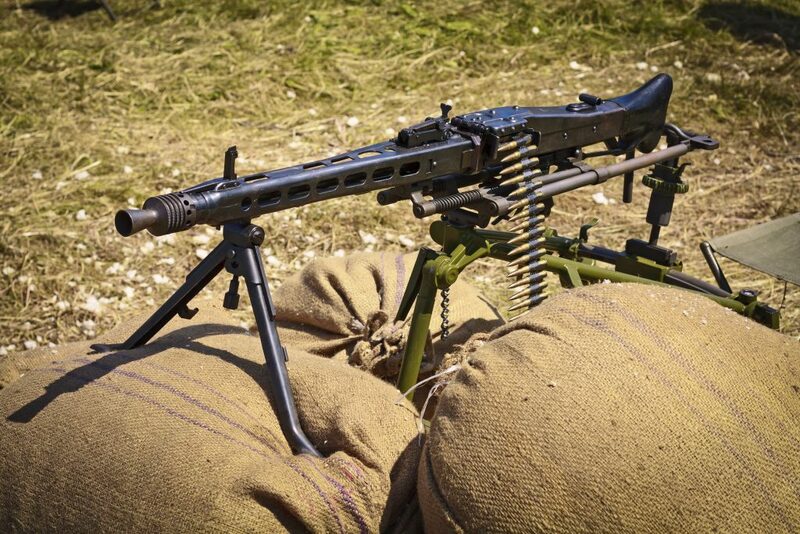 One of the best machine gun of the war was the German MG 42, which was introduced in 1942. It had the nickname Hitler’s buzz saw. It had an average rate of fire of 1,200 rounds per minute so that when it fired it was at too fast a rate to tell each shot apart. However the downside of this weapon was that it required more ammo to sustain it because the rounds were used so fast. Now an obvious question is if these weapons have an equally powerful bullet to a rifle and at the same time a higher rate of fire and range than why did the army even have riflemen. Machine guns were much more expensive to make than a rifle. They were also heavier and less portable. The recoil was so much that it had to be mounted on a bipod to have decent accuracy. These weapons were perfect for defensive purposes to mount on a wall or a window but not in offense to assault a position. Those were better left to rifleman and submachine gunners. In World War 2 there were three main types of weapons to shoot down enemy aircraft. Some of these were far more powerful than others. They could also be used only at certain times depending on how high a plane was because they had various ranges. Some were well equipped for aircraft of different speeds and sizes. The first type are heavy machine guns. 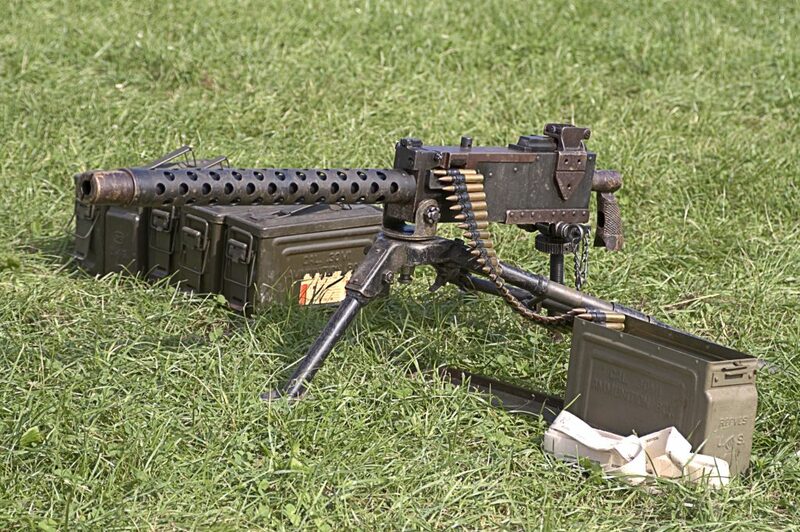 Heavy machine guns had a caliber of at least .50 but less than 20mm. They would be great for engaging low flying aircraft and because of their rapid fire could be aimed at fast aircraft as well. They were not as effective against heavy aircraft like bombers. Bombers were too massive and often flew too high for these guns. These guns could and would also be used against infantry and unarmored or lightly armored ground vehicles. Some examples include the American .50 M2 and Soviet 12.7mm DShK. 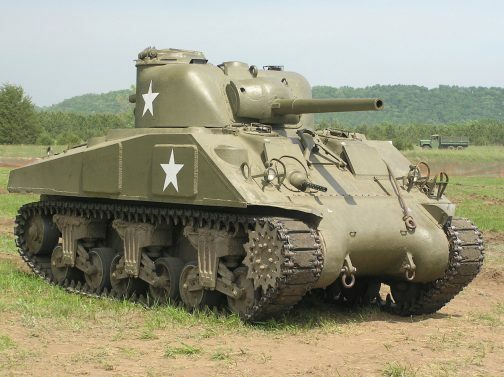 American M2s would often be mounted on various vehicles such as tanks, half-tracks and armored cars. Sometimes even regular jeeps would have them. The second type are anti-aircraft autocannons. These are 20mm or heavier but usually no more than 40mm. They would fire at a rate almost as fast as heavy machine guns. They were more powerful and could have an explosive shell. They also had a higher firing range so could reach aircraft at much higher altitudes but could not reach certain aircraft such as the B-29 Superfortress when it was flying at it’s maximum height. They could also be used against lightly armored vehicles and infantry. Some examples include the Swedish 40mm Bofors used by most of the Western Allies, German 2.cm flak 30/38 and and Japanese 25mm type 96. 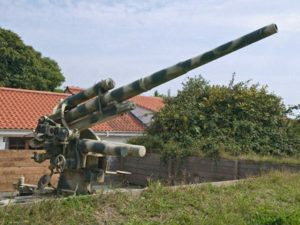 The third type are called anti-aircraft cannons. They were the largest in size and the size of the round fired. They were not automatic. They would often be set to explode at a certain altitude to have a better chance of causing damage. Planes could not fly high enough to avoid the range of these guns. These guns were the most effective at taking down bombers or cargo planes especially when they flew in large formations. One direct shot from these could destroy any plane by touching any part. Even the explosion of a shell in midair could destroy the plane if it was very close. They were so powerful that most could also be used to destroy heavy tanks at regular ranges. However faster and more maneuverable planes would be harder to hit. Also these were generally smaller targets. 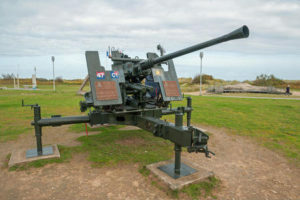 Some examples include the German 8.8cm flak gun, American 90mm M1, and Soviet 85mm M1939 (52-k). All of these guns were deadly and were used best for certain targets. The guns with larger rounds were also heavier and less easy to transport at a moments notice. For example heavy machine guns could be carried by just two men, one for the gun and the other for the tripod. The others would need horses or vehicles to move them. Also they could all work against not only aircraft but infantry and various ground vehicles. For example heavy machine guns could penetrate light armor at most but anti-aircraft cannons could even destroy heavy tanks. In World War 2 there were four main types of anti tank weapons. Each of these three were mainly designed to destroy against armored vehicles. They had various ranges and firepower. Some could be lifted by a man while some of the larger ones needed to be towed. The first type is the anti-tank rifle. These are large rifles with a large caliber bullet mean to destroy armored targets. These were generally greater than .50 caliber but not larger than 20mm. They could be carried by one man but were fired while in the prone position. These weapons were not powerful enough to destroy medium and heavy tanks but could destroy non-armored vehicles and lightly armored vehicles such as half-tracks, armored cars and light tanks. The Polish kept their version of the rifle a secret before it was used to deadly effect. Because all the German tanks in 1939 during the invasion of Poland were not heavily armored the Polish were able to use their anti-tank rifle very effectively. Some examples include the Polish Wz. 35, British Boys, And Soviet PTRD-41 and PTRS-41. The second types of anti-tank weapons are man-portable anti-tank rocket launchers. These are extremely similar. A crew of two used these. One would aim and fire the weapon and the other would load the next round. These were more powerful than anti-tank rifles. They were mainly defensive weapons and not to chase down armor. These could not be fired indoors because they had a huge back blast, which was dangerous. Anyone standing in an enclose space or directly behind this weapon when it fired could be seriously injured. Some examples are the American 2.36 inch (60mm) bazooka, German 3.5 inch (88mm) Panzrschreck. Another weapon very similar was the German 60mm Panzerfaust. It was slightly different because it could not be reloaded. This weapon was a one shot disposable tube launched weapon. It had an even closer range but was very deadly. It could be used by just one infantryman. The third is the anti-tank gun. These were large guns on wheels that had varied in size and firepower more than any of the other types. Some were very small like the American M3 37mm and could only destroy light tanks. 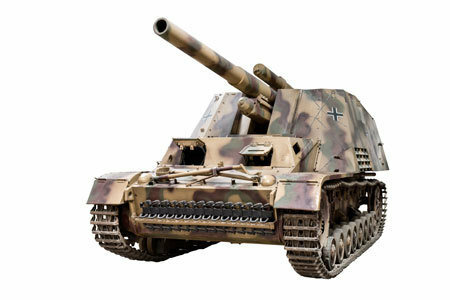 Others like the German 8.8cm Pak 43 were capable of destroying almost any tank. Some other examples include the Soviet 76mm M1942 Zis-3 German 7.5cm Pak 40 and British 6 QF 6 Pounder. They had gun shields that would protect the crew of the gun from small caliber fire. The fourth were self-propelled meaning that they were the main gun of an lightly armored vehicle making them more portable but more expensive and less simple to produce. These would become known as tank destroyers an example of a self-propelled version was the German Marder II that mounted the Pak 40 as its anti-tank gun. All of these weapons were designed to destroy armored vehicles. However they could be fired at infantry. They would be very effective at destroying buildings with the exception of the anti-tank rifle because it did not produce an explosion. 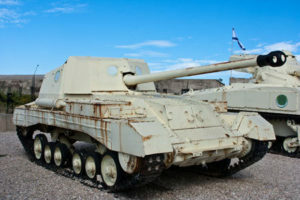 The first three are mainly defensive but the self-propelled gun could be used offensively because it was mobile and fast enough. This made it excellent for hunting tanks. 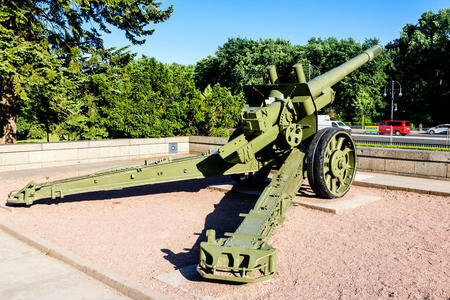 In World War 2 there were three main types of artillery. All had the same purpose of bombarding and area with large amounts of explosive ammunition. This would soften up an area before an attack. The purpose was to kill some enemies, destroy equipment and fortifications. If an attack by infantry and tanks would follow the area would be in a state of disorientation and many necessary defenses would no longer be there to repel the attack. Artillery could also be used to surround an area and siege it. Artillery was not meant to be very accurate because they were used in mass and each round was not meant for a certain target. The first types of artillery were mortars. Designated mortar men would use them to shoot an explosive shell into the air used these and it would come down on the enemy. The round was simply inserted into the tube and would fire once it hits the bottom of the mortar. There was no trigger on the mortar. The mortar generally was the smallest caliber and could be moved by an individual man. It came in three parts. It would be a long tube that shot the mortar, a baseplate to put the tube on and a bipod that the tube would lean on. 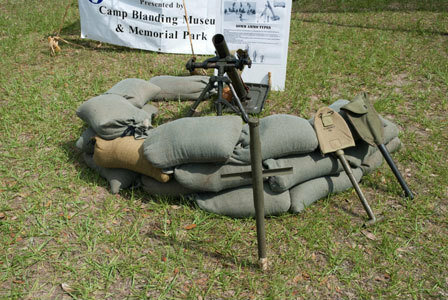 Some examples of mortars used were the American M1 81mm mortar, American M2 60mm mortar, German 8cm Granatwerfer 34, Soviet 82mm-BM-37 mortar. These were all based on the original design of the French Brandt Mle 27/31 81mm mortar. 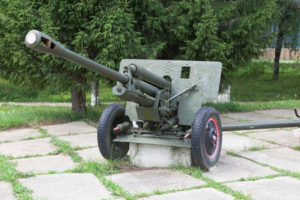 The second type of artillery is the howitzer. These were much larger in size and caliber of the shell. They also had a much longer range but were less portable. They were too heavy to be carried by a person so vehicles or even horses often towed them. This was possible because they had wheels. The barrels were very long so the shell had a high muzzle velocity or speed. If they happened to get very luck and hit a tank almost any tank would certainly be destroyed. Some examples are the American M101 105mm howitzer, German 10.5cm leFH 18, German 15cm sFH 18 howitzer, Soviet 1937 152mm M1937 (ML-20) howitzer. The third type of artillery is the self-propelled artillery. These are armored vehicles that have a howitzer as the main weapon. These vehicles would almost always have tracks and not wheels. Often they would also have a machine gun as a secondary weapons. These vehicles would usually stay far away like the other types of artillery. Some examples were the American 105mm M7 priest, German 15cm Hummel and Soviet 152mm ISU-152. These are the main types of artillery during World War 2. There were some others like Rocket Systems but most countries did not use rocket artillery. The Soviet BM-14 and German 15cm Nebelwerfer 41. Almost all countries used the other three types of artillery especially mortars and howitzers. Artillery put emphasis on firepower, explosion radius and numbers of shells fired instead of accuracy. In World War 2 there were different types of hand grenades with different shapes and purposes. Every country used hand grenades during the war. All hand grenades were small and easy to both carry and use. 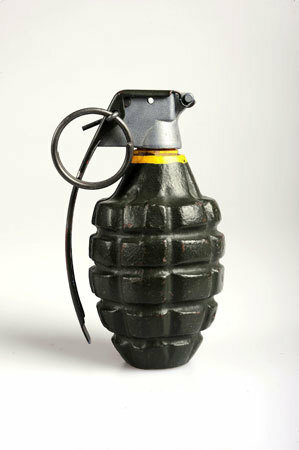 The first and most common type of hand grenade was the fragmentation grenade. After igniting the fuse these grenades would usually explode after about 5 seconds or so depending on the grenade. The soldier would then throw the grenade and it would explode killing or injuring anyone within a certain radius depending on the grenade. These were the most useful in clearing out rooms in a house or bunker. Because it was an enclosed space escaping the blast would be very difficult. The Americans used the famous Mk2 grenade. It was nicknamed the pineapple grenade because it looked similar to a pineapple. The German Fragmentation grenade was the Model 24 and unlike most grenades in the war it was a stick grenade. They were nicknamed the potato masher because it resembled the cooking utensil. It was not round like the American pineapple or the British Mills Bomb. It was long and could be thrown farther and more accurately because of the shape which allowed for a spin while throwing it. The Soviets actually used both round and stick grenades during the war like the RG-33 and F1 frag grenades. The second type of grenade was the smoke grenade. It had no harmful affects and was not a dangerous weapon. When it was thrown and it would create a white smoke screen. This was excellent in moving from cover to cover when under enemy fire. The smoke grenade was extremely useful for soldiers and extremely annoying for snipers. The third type of grenade was much rarer. It was the anti-tank grenade and they were dangerous to use and most often not used effectively. To get into hand grenade range of a tank was extremely dangerous and difficult. Also the grenades needed to land on the tank at exactly the correct angle. The British sticky bomb would sometimes get stuck on the soldiers’ clothes who was throwing the grenade with disastrous result. Overall they were not that useful. A fourth type of grenade was the incendiary grenade. These were often used in the form of a Molotov cocktail. A Molotov cocktail was usually an alcoholic drink but could be anytime of flammable liquid such as gasoline. It would be in a glass bottle stuffed with cloth that would be lit like a wick. This grenade would then be thrown at infantry. It could also be thrown at both unarmored and armored vehicles. These were easy to make weapons and very effective but horribly brutal. The last type of grenade was the rifle grenade. These were grenades that would be designed to go on the end of a rifle. The user of the rifle would pull the regular trigger of the rifle to launch the grenade allowing the grenade to go farther than if was thrown. They could fire either fragmentation, anti tank or smoke grenades. The anti-tank grenades were much easier to use in the form of a rifle grenade because they would shoot farther and impact faster in a shaped charge. These are the main types of grenades that were used during the war. As you can see each had a different purpose. Certain situations would call for certain types of grenades. In WW2 there were three types of tanks. They were light, medium and heavy tanks. Tanks were and still are generally rated on 3 main characteristics. They are speed and mobility, armor and armament. No tank is capable of reaching the maximum performance in any area. For example if a tank is too heavy it cannot be as fast as it could have been if some armor was removed and it weighed less. Light tanks are focused on speed and mobility. Therefore they have lighter armor making them low in weight and fast. They can also travel with less fuel than a large gas guzzler. Some examples of light tanks are the American M3 and M5 Stewart German Panzer 2, Soviet T-26 and Japanese type 95 ha-go. All of these tanks were mobile and able to move over tough terrain but had thin armor and a weaker main cannon. Weak anti tank weapons such as anti tank rifles were able to penetrate the armor of most light tanks. They were produced in less numbers than medium tanks but more than heavy tanks. Medium tanks are in between light and heavy tanks in all the three main areas. They consume more fuel than light tanks but less than heavy tanks. The armor is also heavier than light tanks and weaker than heavy tanks. Some examples are the American M4 Sherman, German Panzer IV and Soviet T-34. They also have larger and more powerful guns than the light tanks but less strength than heavy tanks. Also the armor is thicker than light tanks but thinner than heavy tanks. Some weaker anti tank weapons like anti-tank rifles were useless against these tanks. American M3 37mm anti tank guns, German Pak 36 37mm anti tank guns, and the Soviet 53-k 45mm anti tank gun also didn’t have much luck against these vehicles unless they were used at very close ranges on the side armor. (almost all tanks, light medium or heavy have the thickest armor in the front). Medium tanks were produced in the largest number of any type of tanks. Heavy tanks are all about armor and armament. The main cannon was usually so powerful it could penetrate almost any armor on the battlefield. The tanks armor was so thick that they would be immune to almost any anti-tank weapon from the front. These vehicles would consume large amounts of gas which was a main weakness of the vehicles. Sometimes these they would break down from mechanical failure because they were almost too advanced for the time. 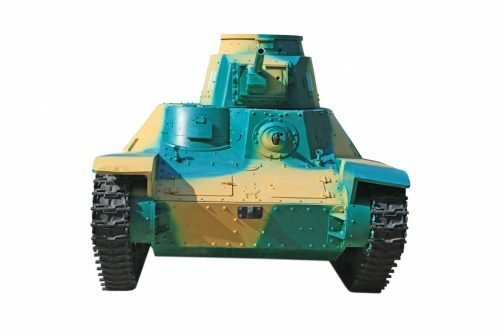 Some examples include the German Tiger and King Tiger. There were also the Soviet KV-1 and KV-2. The Soviets also had the IS-2 Stalin tank named of course after Soviet leader Joseph Stalin. 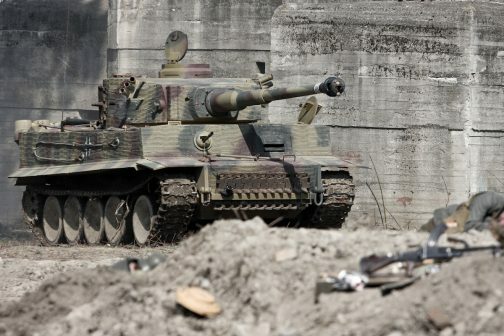 Heavy tanks were produced in small numbers because of the cost and sophistication of these vehicles. Light tanks would go on to make great use as reconnaissance later on in the war when they became to weak to go on to the battlefield and face medium or heavy tanks. They were still useful in the Pacific Theater until the end of the war because Japanese tanks even were not as heavily armored as their American and European rival tanks. Medium tanks would sometimes be upgraded with a better gun to deal with heavy tanks. Heavy tanks were generally the king of the battlefield and modifications in their role or characteristics did not change much. 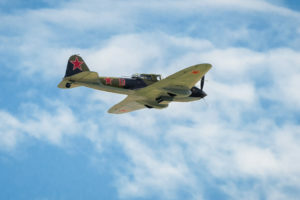 During World War 2 there were several different types of planes each had many different models. The main types of planes were transport, bombers, fighters and ground attack. Depending on the role the plane was suited to it would change the average size, mobility and speed. For example bombers were often larger than fighter planes. Each of these planes will be explained. The Second type of plane is the bomber. These were also large planes that were not very fast or mobile. The goal of the bomber was to drop bombs onto a target. They would drop massive amounts of bombs at a time and would often target enemy soldiers, factories and even civilian populated cities. They were often used in mass and would be a psychological effect to both troops and the civilians in the city. Famous bombers of the war include the American Boeing B-17, German Heinkel He 111, Soviet Petlyakov Pe-2 and Japanese Mitsubishi Ki-21. Fighter planes are the third type and they are designed primarily to combat enemy planes. They would be used to shoot down all types of enemy planes. Many were also equipped with some way to attack the ground. Fighter planes would often use strafing runs to attack the ground with automatic weapons in hope that they would get lucky and hit the enemy. A pilot who had shot down 5 or more other enemy fighter planes would be called an “Ace”. This was a title of a truly skilled pilot. 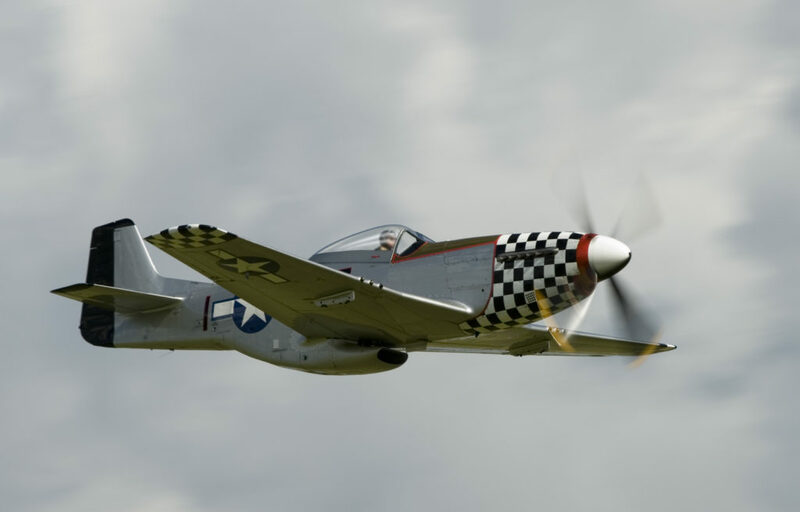 Some of the most famous fighters of the war were the American P-51 Mustang, British Supermarine Spitfire, German Messerschmitt Bf 109, Soviet Yakovlev Yak-1 and Japanese Mitsubishi Zero. Ground attack planes are the fourth type and they are a bit of a mix between the large bomber and maneuverable fighter. Some planes like the American P-40 Warhawk had both fighter and ground attack variants available. 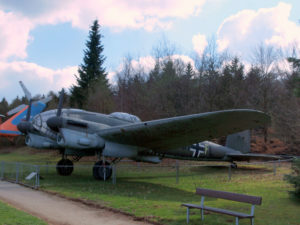 The German Junker Ju-87 and the Soviet Ilyushin Il-2 were both famous planes designed to attack ground targets even tanks. The last type of planes were Reconnaissance aircraft. They were made to find information such as the number of enemies they were up against and the position of the enemy. This information could be used by command to make decisions on the battlefield. The American Curtis SC Seahawk and German Focke-Wulf FW189 were both designed to observe and report. All five played their role but certain planes were more mass-produced than others. For example many more bombers were built than reconnaissance aircraft partially because the bomber could do some reconnaissance itself. These are the main types of planes that were used in World War 2. Rifles were the most common infantry weapons in World War 2. There were many more rifleman than both submachine gunners and light machine gunners. 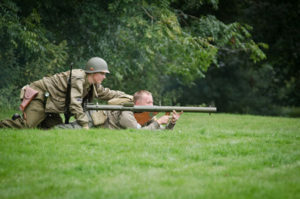 In World War 2 there were two main different types of rifles, bolt-action and semi-automatic. 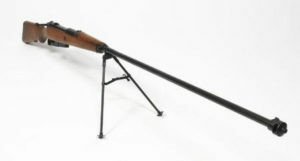 One type of rifle was the standard bolt-action rifle. These rifles were older and had been used in huge numbers during World War 1. These types of rifles had a handle that needed to be pulled back manually each time before the rifle was fired. This causes a much slower rate of fire than automatic weapons or even semi-automatic rifles. These were the most common types of rifles on the battlefields of World War 2 because of how cheap and mass produced they were. Many were left over from previous wars. They sometimes had telescopic sights would be attached to these rifles to make them into sniper rifles. Most bolt-action rifles had clips of 5 rounds. Examples were the German Kar98k, Soviet Mosin-Nagant, Japanese Arisaka and Britism Lee-Enfield, and Italian Carcano. Semi-automatic were newer so none had been produced before the war. These rifles were rare for most countries until later on in the war. For example the German Gewher-43 was produced from 1943 so up until then all German rifles were the Kar98k bolt-action rifles. The Soviet SVT-40 semi-automatic rifle was produced in far less numbers than the older Mosin-Nagant bolt-action rifle. The main advantage of semi-automatic rifles was that they could fire as fast as the trigger was pulled. Also they usually held more ammunition than their bolt-action counterparts. Rifles were used best at medium range. At close range they were not very useful especially the bolt action rifles because of the slow firing rate. Any rifleman would be at a severe disadvantage against a submachine gunner in close range. They could be used at very long ranges especially if the target was not moving or the rifle was equipped with a scope. In World War 2 all troops were issued a sidearm which is a handgun that is carried as backup in case a soldier either runs out of ammunition for their main weapon or that weapon jams or breaks. Because the sidearm is a handgun these weapons are used at short range. Once a soldier was no longer able to use his main weapon often the best he could do is stay and defend himself and his brothers in arms with his short range sidearm. 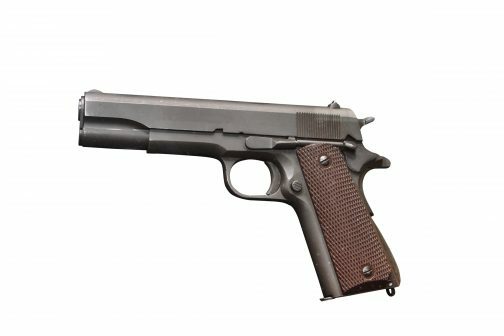 American soldiers carried the Colt M1911 .45 caliber pistol. This pistol carried 7 rounds in the clip. This weapon was also used by American troops in World War 1. Its .45 caliber round was very powerful and could penetrate thick materials great stopping power. Stopping power means how well each shot it able to stop a man coming at you. It was also very reliable and would rarely malfunction. Lower ranking German soldiers carried the Walther P38 pistol. Higher ranking officers would carry the classic Luger pistol used in World War 1. It should be noted Lugers were highly valuable to any allied soldier who managed to kill a German officer or find one. The P38 used the 9x19mm Parabellum. This was a weaker round than what the American soldiers used and would not be able to penetrate as thick of materials. The P38 carried 8 rounds in the clip. 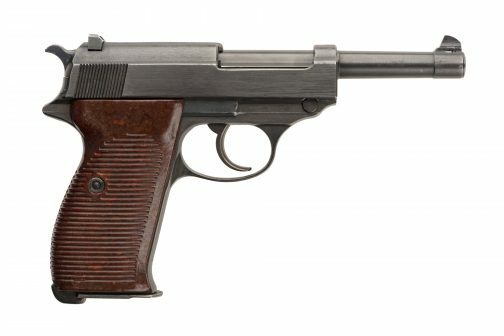 The Most modern Soviet pistol was the Tokarev TT-33. It used the 7.62×25 Tokarev round. This bullet is excellent at penetrating most objects but does not have the stopping power that the .45 has. 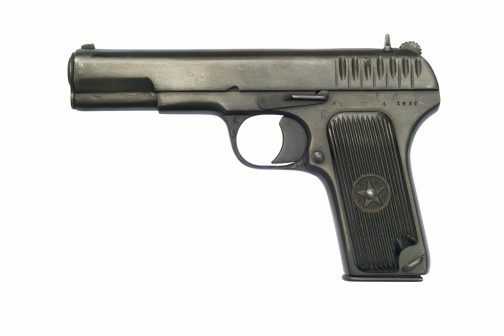 The TT-33 has an 8 round clip. It was designed to replace the older M1985 nagant revolver but because not enough were produced it ended up serving alongside it instead of fully replacing it during World War 2. British Enfield number two .38-caliber revolver with a 6-round cylinder. 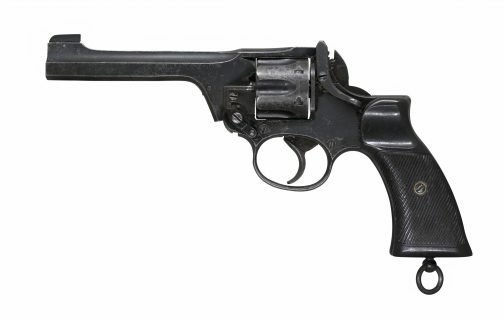 The most common British commonwealth sidearm was the Enfield number 2 revolver. This was also the most modern sidearm used by the British Commonwealth forces. It used a 9.65mm round. This revolver had a 6 round revolving cylinder. However this gun had an extremely low range of only about 15 yards. Tankers would carry sidearms in case their vehicle was knocked out or broke down. If they survived the vehicle being hit and had to leave they would use these weapons as their last defense. Pilots would also carry a sidearm in case their plane crashed and they survived. However even though almost all American soldiers carried a sidearm not all armies could give every soldier a sidearm such as the Soviets. The Americans had no problem producing enough material for its soldiers. In many poorer and less developed countries this was not the case. World War 2 was the first war to have widespread use of submachine guns. Submachine guns are automatic carbine. These weapons though longer than a pistol fire pistol sized rounds such as the 9mm or .45 caliber. Some guns like the American Thompson Submachine gun used the more powerful .45 caliber. The Soviet PPSh-41 used a 7.63x25mm round, both the German MP40 and British Sten used the 9x19mm round. The MP40 was a very accurate gun and was more effective at farther ranges. 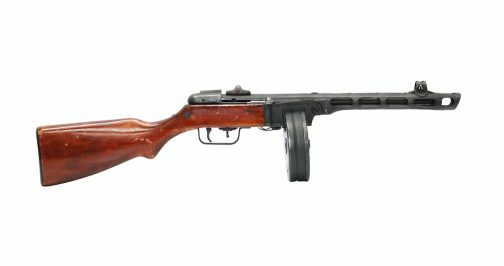 The PPSh-41 had an advantage with it’s higher rate of fire at cost of accuracy. The Thompson had an extremely powerful round. It was able to penetrate more material so thinner items were not useful as cover. 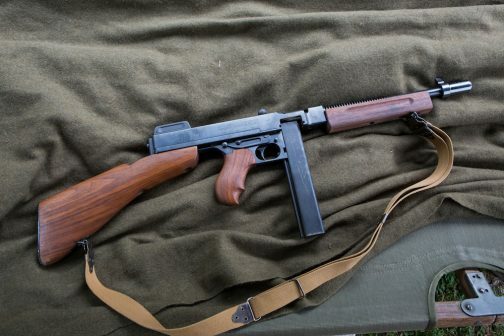 It should be noted that the Thompson was a great gun but it was more complex than other submachine guns so it was more expensive and slower to produce than other guns such as the much simpler and cheaper M3 “Grease Gun”. 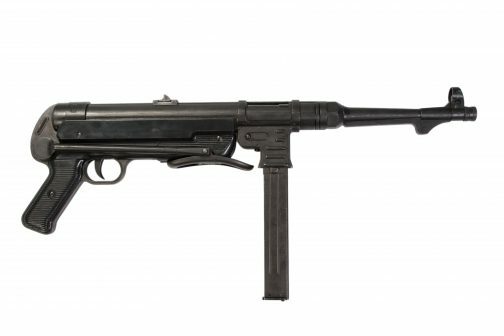 Submachine guns were always best used in close quarters combat, urban warfare, and street by street fighting instead of war away on the other side of a field. They were much easier to maneuver than a rifle in close spaces because rifles were to long and would have a harder time avoid hitting walls and doorways. Also since a submachine gunner could simply hold down the trigger and fire many rounds that at so close ranges were very likely to land a shot. At longer ranges especially 300 meters against a rifleman was extremely dangerous because the submachine gunner could not fire accurately at the rifleman but the rifleman could fire back with a well place shot. However they still could provide some cover and make the rifleman have to stick his head down. If a soldier hears that automatic weapon firing so many rounds in such a short time it may seem dangerous to poke your head up. This would be especially true if you saw that some rounds were hitting only a few feet away from you. It would cause that thought of be careful one of those many rounds might just hit. Though submachine guns were used in World War 1 in small numbers World War 2 was the first to have such a wide scale use. As with every type of weapon such as rifles, light machine guns and carbines they had their advantages and disadvantages. The Premier World War II Web Site © 2019. All Rights Reserved.